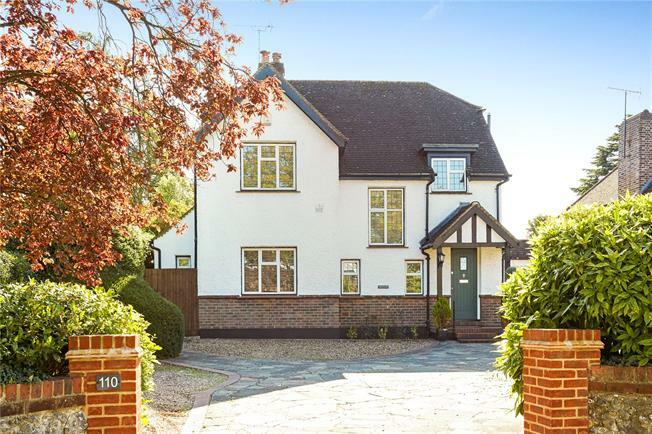 4 Bedroom Detached House For Sale in Banstead for Asking Price £925,000. This beautifully presented and wonderfully bright and airy four bedroom detached house in popular Nork has recently been extended at the rear to create superb living space with an open-plan kitchen dining room and a double reception room, ideal for the modern lifestyle and for those who love to entertain. Bi-folding doors open onto a pretty rear garden with dining area, perfect for alfresco dining. The bedrooms and bathrooms are all conveniently arranged on the top floor with a study on the ground floor which could be used as a fifth bedroom if one wished. The house has a light, neutral decor throughout and a contemporary kitchen and bathrooms, and with a guest WC, utility room and garage as well as plenty of off-street parking on the drive. Planning permission has been granted to extend the garage and create an additional bedroom and bathroom making it the most suitable long-term home for any discerning buyer. SOLD BY HAMPTONS IN EPSOM. The house is located in the middle of Nork Way which joins Banstead to Reigate Road. The open spaces of Nork Park are within easy reach, as is nearby Banstead train station which offers directs routes into London. Popular Warren Mead Infant and Junior School is also very near by and there are several shops conveniently located at the top of the road.